Survey of the American Professoriate, 1977. Amazon.com description: Product Description: The File is a collection of documents from a major dispute involving a number of American college professors, mainly mathematicians, statisticians,and sociologists. The controversy was ignited by the mathematician Serge Lang's reaction to a questionnaire, "The 1977 Survey of the American Professoriate", distributed by E. C. Ladd of the University of Connecticut and S. M. Lipset of Stanford. The ensuing discussion - in part acrimonious and personal - soon involved a large group of active and passive participants, and included issues such as survey techniques, evaluation of academic work, public and political honesty, and McCarthyism at Harvard. 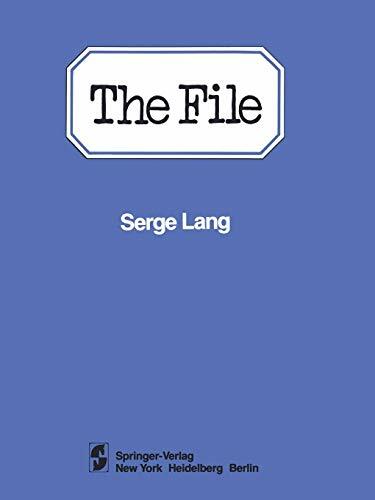 About: The File is a collection of documents from a major dispute involving a number of American college professors, mainly mathematicians, statisticians,and sociologists.